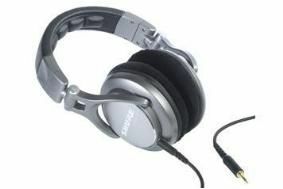 Shure adds trio of new models to its headphone range | What Hi-Fi? Shure's new line-up starts with the £100 SE215 sound-isolating earphone, featuring a new Dynamic MicroDriver and a detachable cable. It's available in clear or translucent black, and is designed to block out up to 90 per cent of ambient sound. Included are three pairs of disposable black foam sleeves and three pairs of soft-flex sleeves (X,M,L) plus a carrying case. For budding DJs Shure has the £100 SRH550DJ model with 5cm drivers for extended bass, an adjustable, collapsible headband that swivels through 90 degrees, and a 6.3mm gold-plated adapter and carrying bag. Finally there's the SRH940 professional reference headphones (shown) with a collapsible, lightweight design which have beeen engineered to provide "tight bass and smooth high-end extension with minimal distortion", says Shure. They cost £249 and come with two detachable cables, a 6.3mm adapter, a replacement set of velour earpads and a hard travel case.